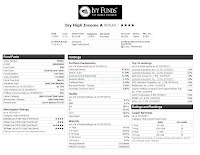 High Yield bond mutual funds offer higher income to investors. These high yield funds also come with higher risk since they invest in lower credit rating debts (mainly corporate bonds). 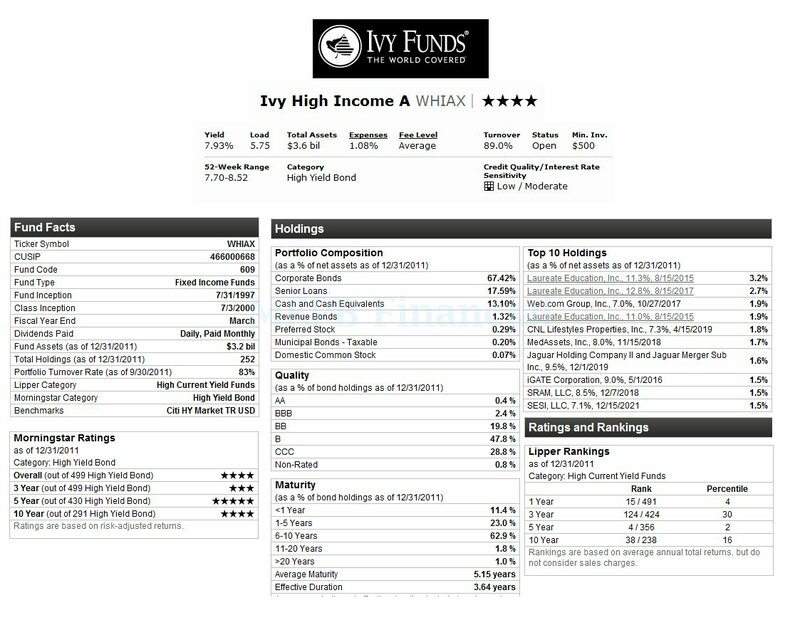 One of the top high yield bond funds is Ivy High Income fund. Review of this best bond fund can be found below. The investment aim of this Ivy High Income fund is to provide total return through a combination of high current income and capital appreciation. This bond mutual fund invests mainly in a diversified portfolio of high-yield, high-risk, fixed-income securities, including loan participations and other loan instruments, of U.S. and foreign issuers. The fund invests primarily in lower quality debt securities (i.e. rated BBB or below by S&P). This fund is managed by Bryan C. Krug since 2006. The fund was first introduced to public in July 2000. The total net assets of this fund are $3.46 billion. The 12-month dividend yield is 7.93% and the most recent distribution was in January 27, 2012 ($0.05). The annual expense ratio is 1.08%, compared to the average in the High Yield Bond category (1.15%). Since its inception, the fund has recorded 10 years of positive return with its best return in 2009 (46.30%). The only year (so far) with the negative return was in 2008 with -20.12%. Based on the load adjusted return, this fund has returned 17.55% over the past 3-year, 7.32% over the past 5-year and 7.80% over the past 10-year. The YTD return is 2.99%. Citi HY Market TR USD is the benchmark of this fund. Morningstar has rated this bond mutual fund with 4 stars rating. Minimum initial investment for the brokerage account of this best high yield bond fund is $500 with minimum subsequent investment of $50. If you are interested in IRA account, please check with your brokerage. This top bon fund is available for purchase from 77 brokerages, such as Merrill Lynch, JP Morgan, Edward Jones, Schwab Retail, Pershing Fund Center, Wells Fargo Advisory, Ameriprise Brokerage, etc. This fund is available in other classes, such as Class B (WHIBX), Class C (WRHIX), Class Y (WHIYX), Class E (IVHEX) and Class I (IVHIX). The portfolio composition of this fund as of January 2012 is Corporate Bonds (67.42%), Senior Loans (17.59%), Cash and Cash Equivalents (13.10%), Revenue Bonds (1.32%), Preferred Stock (0.29%), Municipal Bonds – Taxable (0.20%) and Domestic Common Stock (0.07%). The top holdings are Laureate Education Inc, Web.com Group Inc, CNL Lifestyles Properties Inc, MedAssets Inc, Jaguar Holding Company II and Jaguar Merger Sub Inc, iGATE Corporation, SRAM LLC and SESI LLC. Principal Investment Risks include: Company Risk, Credit Risk, Foreign Securities Risk, Interest Rate Risk, Liquidity Risk, Loan Participation Risk, Market Risk, Reinvestment Risk, Low-rated Securities Risk, Management Risk, etc.